← Journey through Los Angeles – My 200th Blog Post! I’ve heard “It must be hard to be vegan in San Antonio!” countless times. I know that statement is not true, so to prove it I started putting together this map about a year ago. When I became vegetarian in 2008 I found that Thai, Chinese, Indian, and Mediterranean cuisines were all inherently vegetarian-friendly. I started to find lots of restaurants that already had vegetarian items on their menu, so it was easy to modify them to be vegan too! Then I started to discover restaurants with vegan dishes already on their menu. This map really began to populate after I was asked by a friend and fellow vegan to recommend some restaurants in San Antonio. After a little more work I decided to share it here on my blog. In the descriptions of each location I added notes from my own experiences along with links to reviews I have done in the past. 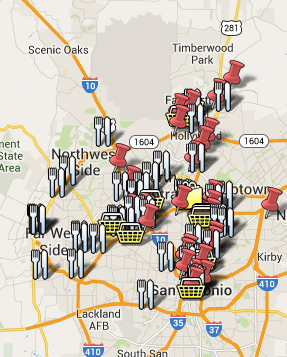 I haven’t visited some of the locations on this map, so I’ve also added comments found by users on UrbanSpoon. I will continue to update this map in the future, but I need your help! Do you have vegan-friendly menu items at your restaurant? Have you visited a vegan-friendly restaurant or store that isn’t on here? Did I get something wrong? Let me know! I’d love to add more locations and update the descriptions! p.s. After watching an episode of The Next Food Network Star, I realized I use a lot of “buzz words” around here that mean nothing – delicious, awesome, amazing, ect. I’ll try to be more descriptive with my food posts and restaurant reviews. I’m here to share “awesome” vegan food, but really I’m trying to show you that it’s more than awesome – it’s crispy, warm, moist, chewy, and always sweet. This entry was posted in Local Feature, Local Restaurant Reviews and tagged Map, Plant-Based, Restaurants, San Antonio, Texas, Vegan, Vegetarian. Bookmark the permalink. Mellow Mushroom at the corner of 1604 W and Stone Oak has build your own salads, pizzas and sandwiches with tofu, tempeh and seitan, lots of vegetables and other toppings plus daiya cheese. Awesome, I’ve added it! Thanks Cyndi! One more, Adelante in Alamo Heights off N. New Braunfels. They have tasty veggie fajitas, Boracho Bean soup, and sometimes vegan chili and/or vegan queso. They have an old school health food vibe, but at one time they were the only restaurant in town with vegetarian options. Twenty years ago they traveled to Austin to co-op shop for the restaurant. I have Adelante on there, but your comments are valuable! I’ve added them, thanks again! You’re welcome :) If you have any suggestions to add, just let me know! Thank you for compiling this map of awesome vegan comestibles!! I live in Waco, TX a small city that is experiencing growth in arts like food, health, music and etc. Waco is a little more vegetarian-friendly than it was 3 years ago when I first became a vegetarian but has some more growing to do to sustain a growing vegan community. I’m not vegan, yet but I’m transitioning!!! Most of the veg restaurants around here are vegan-friendly, but I’m hoping for vegan restaurant(s)/businesses for Waco. You should visit Waco Texas when you get the chance I can put together a map for you featuring places and events that are vegetarian/vegan-friendly!! We like Austin but with small city charm. Thanks so much for your comment! It’s always great to hear about Vegan options in other Texas cities. We visit Austin and Houston every so often, which both have lots of amazing vegan businesses. San Antonio is transitioning and I’m happy to document that shift. Best of luck with your transition into veganism! Thank you so much for this!! I just went vegetarian a month ago and I’m on my journey to going Vegan so I am so excited to have found this. I have never felt better about myself not only morally but also internally I have seen such a difference. I live with a carnivore who loves to eat out so I’ve had a lot of fun figuring out what to eat at places he goes. I found that Ajjua off of Huebner has vegetarian tacos! Also for vegetarians that like taco cabana I just found out today that they will substitute the meat for guac in cabana bowls which were my favorite before I went veg! Fudruckers and BK also have Veggie burgers…I’ve had to be pretty inventive and this map is going to help out SO much especially as I start transitioning to Vegan, sometimes I even find myself eating veggie sides at places that don’t have vegetarian or vegan options. Thanks so much for your comment! I hope you find it helpful. Thanks for the Ajjua recommendation, I’ll have to check them out. I know there are options at fast food places, but I wanted the locations on this map to focus mostly on independent local businesses that offer more sustainable options. I’m also a big fan of vegetarian and vegan options already on their menu, so you don’t have to make lots of modifications. There are too many awesome vegan-friendly places for you to eat a plate of sides! Please feel free to let me know of any other places you find.